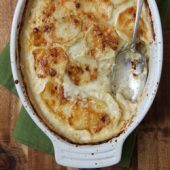 A classic potato dish with four varieties of cheese, garlic and a nice spicy kick! A perfect side dish for any occasion. Preheat oven to 400°F. Lightly grease a 1-quart baking dish. Toss cheese together in a large bowl. In a medium bowl whisk together salt, pepper, red pepper flakes and garlic with the heavy cream, set aside. Carefully peel and slice potatoes into 1/8-inch discs, using a sharp knife or mandoline slicer. Add two layers of potatoes to prepared dish, topping off with a small handful of cheese. Repeat layers until all potatoes and cheese have been used. Top off with heavy cream mixture. Bake for 50-60 minutes or until potatoes are fork tender and top is golden.